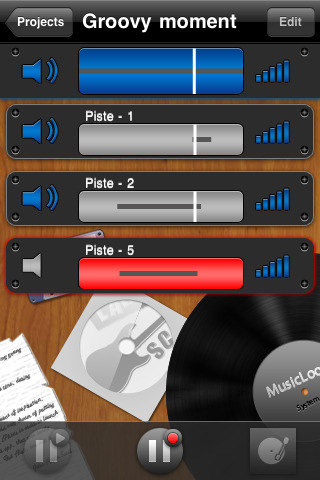 Music Loop is basically a traveling voice recording & mixing app, Like an old school four track but even easier to use. Hopefully you’ll all have better luck with this app than i did. I really, really wanted to love the Music Loop app. They have the right idea, a solid, easy to navigate interface, colorful Graphics and a User-friendly instruction guide. The editing tools are quickly accessible and a snap to load. I was able to understand all the basic functions instantly upon clicking the Question mark symbol at the bottom right hand side of the app on the cover page. In theory, this app should allow you to accomplish a number of things all in one portable place, your iphone. This list includes Creating a simple project, Deleting tracks/projects, Editing names, Mixing your music and finally my favorite part! Sharing your creation with the world! Alas this was not my experience, I was able to set up a new project and name the new project, but as soon as I clicked the record button I knew something weird was going on. I listened back to what I had just recorded and the sound it played back to me was a high pitched fuzzy buzzing Wahhhh kind of noise. Which believe me, was not what I had recorded. I tried plugging in my head phones and closing and opening the app several times to see if I could make it work. No such luck for me. I can only hope that somebody is working on fixing this, It would be a great help to musicians everywhere if it worked properly. Instead I would recommend the simple to use free voice memo recorder app. For a musician like myself, who is constantly on the go, I do not have time to stop & go to the studio to record whenever I feel like. So my solution is the track voice memo recorder, for when I am traveling and a song idea comes to me, I am ready to record it in seconds with the help of my simple yet extremely effective & did I mention FREE voice memo app recording tool. Not only does this app work properly but it also allows you to share your recordings via email, which is nice and handy plus, I never loose my songs ideas this way because they can always be found in my email. AppSafari review of MusicLoop was written by Christin Chambers on March 28th, 2010 and categorized under App Store, Music, Utilities. Page viewed 5487 times, 2 so far today. Need help on using these apps? Please read the Help Page. Thanks a lot for this sincere review. Which is why I’m really sad that the app didn’t work for you ! Can you contact me at this email address to discuss (and hopefully address) the problems you encountered ?